Pressure Indicator: Spare Air requires filling. Pressure Indicator: Spare Air is filled to 3000 psi. 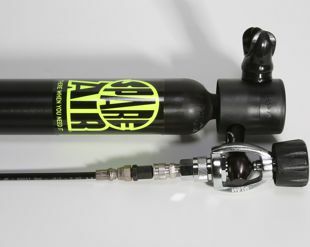 SPARE AIR IS QUICK AND EASY TO REFILL! Spare Air is a refillable, fully self-contained breathing device. The always-on regulator is ready to deliver live-saving air in an underwater emergency or toxic air environment. The pin on the standard Pressure Indicator will rise while filling and when flush with the top, unit is full at 3000 psi. The pin will recess into the pressure indicator when the unit requires refilling. With the optional Dial Gauge Pressure Indicator the needle points to actual pressure in psi or bar. Spare Air should be stored full or with some positive pressure to prevent contaminants from entering the cylinder. Store in a clean, dry environment with optimum temperatures of 50-75ºF for best product performance. Avoid direct sunlight, automobile trunks or other areas subject to temperature extremes. Industry guidelines recommend replacing air in cylinders annually. 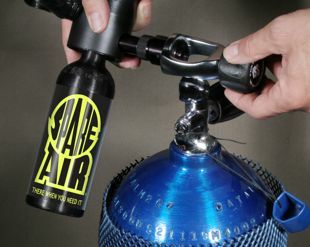 Spare Air can be filled using the SCUBA tank refill adapter attached to a filled 3000 psi SCUBA tank. Thread the 910S Tank Refill Adapter onto the check valve port of your Spare Air. SCUBA tank must be full in order to completely fill Spare Air. 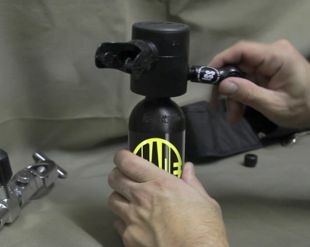 Place the refill adapter onto a filled SCUBA Tank. Slowly open the tank valve to allow the pressure to equalize, filling your Spare Air. 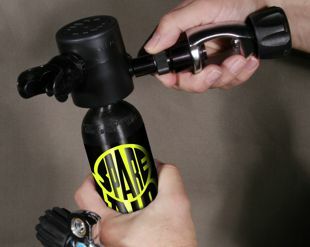 The Spare Air can be filled at any local SCUBA Diving Shops using the optional air compressor refill adapter. Thread the 920C Air Compressor Refill Adapter onto the check valve port of your Spare Air. 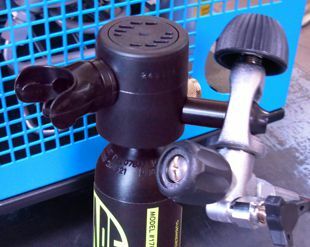 Attach the compressor whip to the refill adapter. Release air into Spare Air to 3000 psi. 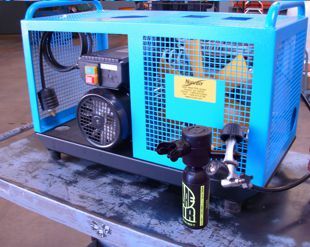 If you have several Spare Airs to refill on a regular basis, a Nuvair Breathing Air Compressor may be your best option. 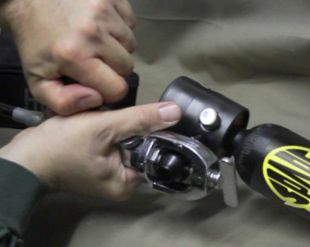 Connect the adapter to the air compressor yoke and turn the compressor on, filling the unit to 3000 psi. Our Custom Hand Pump includes 2 additional necessary adapters. 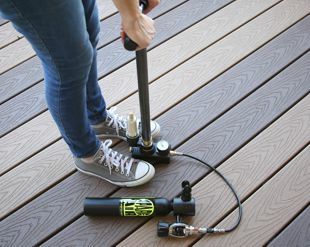 Attach Adapter to Spare Air and pump up to 3000 psi. Note: if the unit is completely emptied of air in any underwater conditions, refer to the manual regarding proper servicing before refilling your Spare Air.